The Fitterfirst intermediate (shown left) and advanced (lower right) soft boards are a slightly different take on balance board training. The intermediate version is similar to a rockerboard design, with a half-cylinder leg underneath that acts as the fulcrum to create an unstable tilting movement. The advanced version has one high center leg, similar to a balance pod, that permits movement in any direction. If you were to compare using the soft board to a traditional wooden board, you might think of what it is like to water board vs. skateboard. 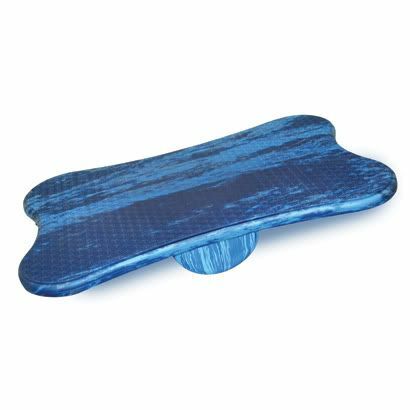 Wooden wobble boards respond to user movements in a very specific directional way while the soft boards elicit more variable fast-twitch reflexes in a 360 degree range. Fitterfirst’s active sitting products, such as the Evolution rolling physioball chair, the 3-D Swopper stool and Muvman sit/stand chair, are also worth a look! Tomorrow we’ll see what’s going on at Gopher Performance!